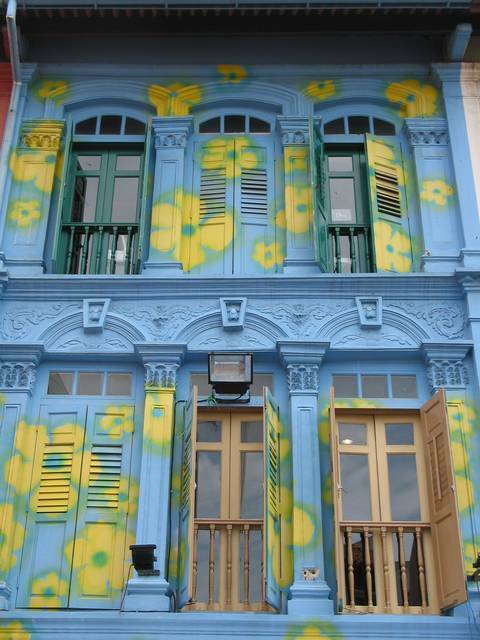 A good place to start, we found out, when travelling to Asia is Singapore. Good thing for us, too, because that happens to be where our flight from Australia took us. In fact, some people call Singapore "Asia for Beginners." It is clearly the most Western of Asian countries, not to mention the fact almost everyone there speaks English. We headed north from Singapore via train through Malaysia. If you are now expecting to hear our usual keen insight focused on that country, let us warn you: it was an overnight train and dark almost the entire time we were there so there is sadly little we can tell you. Our style of travel at this point on The Enchilada has devolved into basically "winging it" as we go. So you'll understand when we say we arrived at the Thai border without any train reservations to Bangkok. That is when we learned only third class was available. 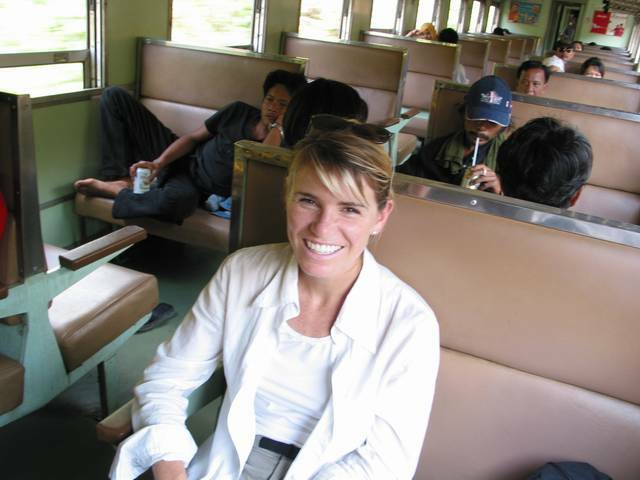 Let's just say that 23 hours in third class on a Thai train is something you may brag about to other travelers, but would honestly move heaven and earth to avoid ever doing it again (don't be fooled by the smile on Karen's face: the train hasn't even started moving yet). 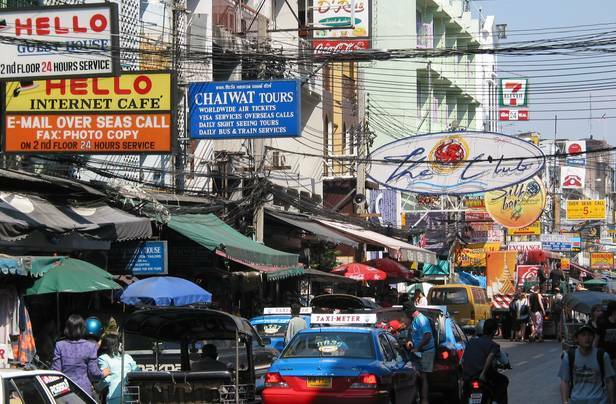 We had modest goals for our time in Bangkok; mostly making arrangements and buying supplies for our trip to Laos. We ended up with a much more rewarding experience than we expected. Through an organization we joined before leaving on our adventure, Servas, we met Phakharanan "Meaw" Thatkhasae . Servas is an international association of hosts who will allow travelers to stay, free of charge, in their homes for a few days. Meaw (her mother said she looked like a cat when she was born) let us stay with her, took us to local restaurants and markets, and introduced us to Thai foods, fruits and vegetables we wouldn't have known existed, let alone dared to eat. 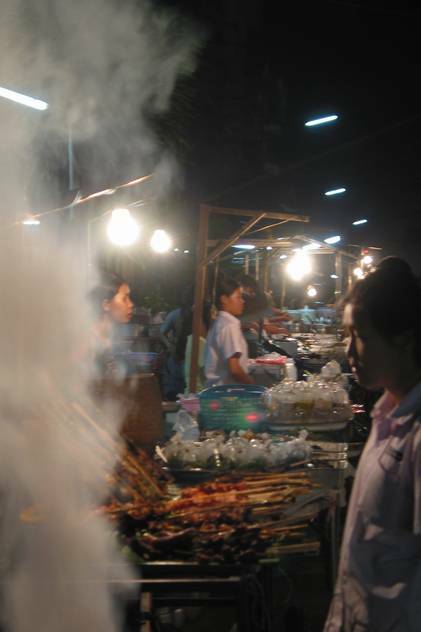 We should mention here that most of our taboos about what constitutes "safe" food on the road were quickly bypassed in order to enjoy Thai cuisine the way the locals do. Meaw even went the extra mile(s) and took us to her hometown of Kanchanaburi, home to the famous Bridge on the River Kwai. 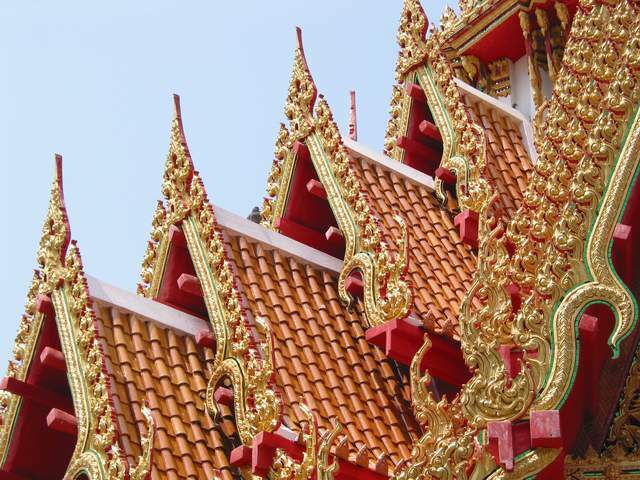 As for Bangkok itself, we were amazed by the expanse of it and the incredible amount of commerce that takes place in it's stores and markets, and on it's streets every day and night. 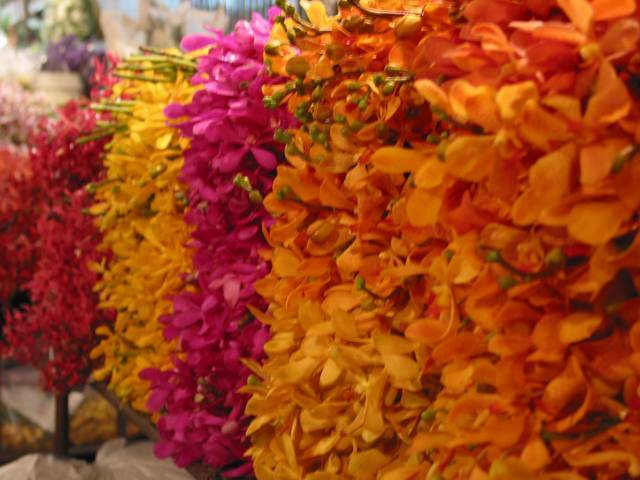 We saw one night market dedicated exclusively to the sale of flowers which took up block upon block of this huge city. 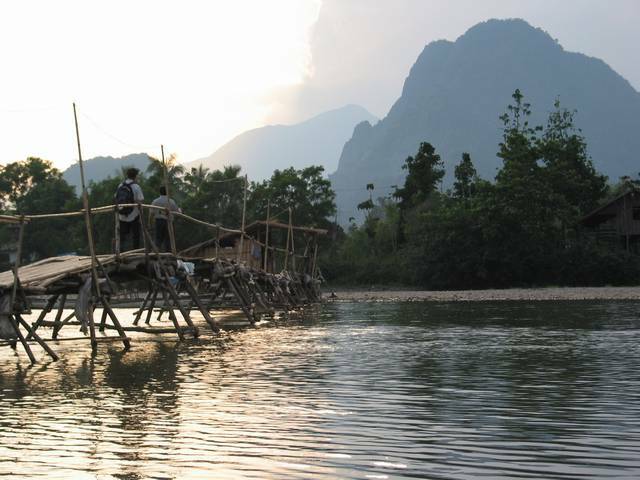 We were often asked why we chose to spend the majority of our time in SEA in Laos, a country we knew so little about. We'd reply that it is because we knew so little (not a darn thing, actually) that's why we wanted to go. 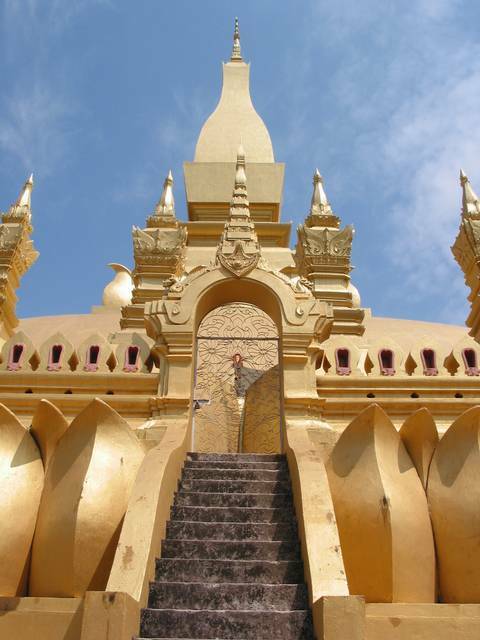 One of the first things you do learn, and a positive thing it is, is how inexpensive Laos is for Americans. During our time there we paid as little as 95 cents for a room and $2.50 for a meal for two including beer. Which brings us to a good place to talk about a subject close to Garvin's heart: Beer Lao. A cold 40 ounce Beer Lao cost less than 70 cents. Laos was one brief shining moment when regular consumption of beer fit within The Enchilada's strict budget. Vientiane is Laos' capital and we spent a few days there trying out Lao food, language and culture. 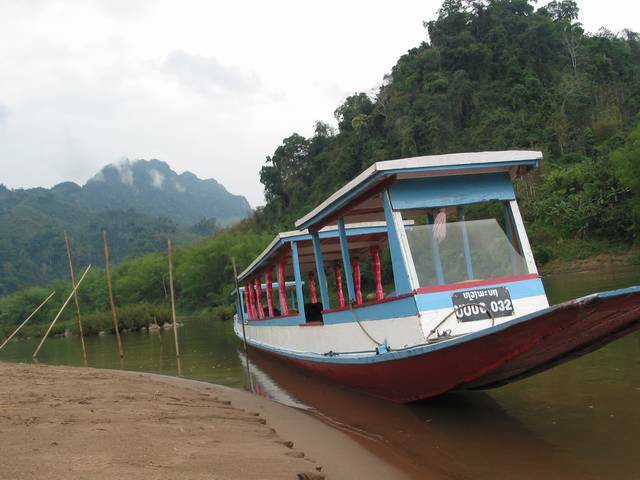 Next stop was Vang Vieng: a growing tourist hot-spot five hours north by bus from the capital city. Over the course of a couple of days there we rented bicycles and went on a day-long kayak trip down the Nam Song river. The scenery was wonderful and the Nam Song provided some small rapids ... small, but big enough to land the two of us up a tree ... literally. The physics of how that happened are too complicated for this limited space. We were also too busy getting out of the tree to take a picture of the scene. Sorry. One enjoyable pasttime for tourists in Vang Vieng is watching bootleg Chinese DVDs at local restaurants. In this way, we finally got to see Harry Potter 2. It was in English, but strangely, had English subtitles as well (clearly done by a non-native English speaker). Therefore, among the funnier mistakes: Hermione became "Shelly," muggles became "melons," and the evil Professor Snape became (get this) Professor Snell. Up north we continued to Luang Prabang. With it's mix of Buddhist temples and French colonial buildings and it's lack of western style commercialism, some have called Luang Prabang the best preserved of all SEA cities. It is in that setting that every morning at six o'clock monks walk through the streets collecting rice in their alms bowls to feed them the rest of the day. 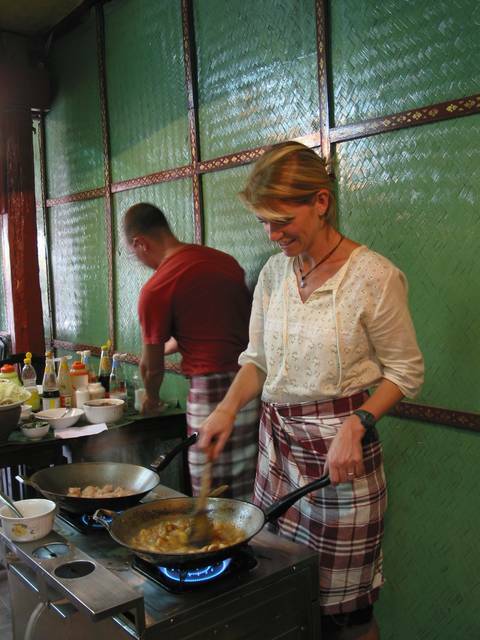 Karen was able to take a day-long cooking course while in Luang Prabang. It included a trip to the morning market to gather fresh ingredients and then back to a restaurant kitchen to prepare traditional Lao recipes. In between cooking tips her instructor educated the group to the fact that anything we every thought of as Souteast Asian food is actually Lao food co-opted by other countries. One of the great things about extended travel is the ability to adapt travel plans along the way. 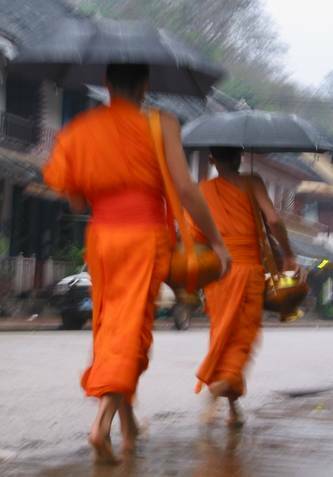 So when we learned that Luang Prabang was the hub of the Lao New Year celebration in mid-April, we decided to head north with plans to return in a couple of weeks. 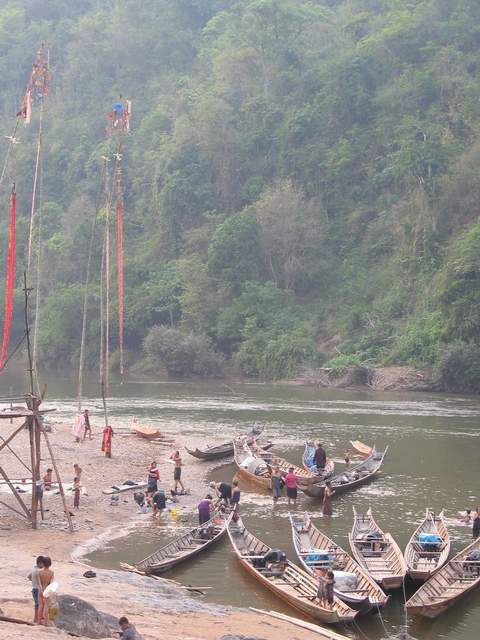 We spent the time in two villages, Muang Ngoi and Nong Khiaw, about five hours up the Nam Ou river by slow boat. These were among the remotest places we visited. Muang Ngoi, for example, can only be reached by boat, has no motorized vehicles, and generator-supplied electricity just four hours each night. Garvin took advantage of his time there by learning from a local fisherman how to fish using a traditional casting net, and Karen spent some time teaching English to children in the village and at the local school. 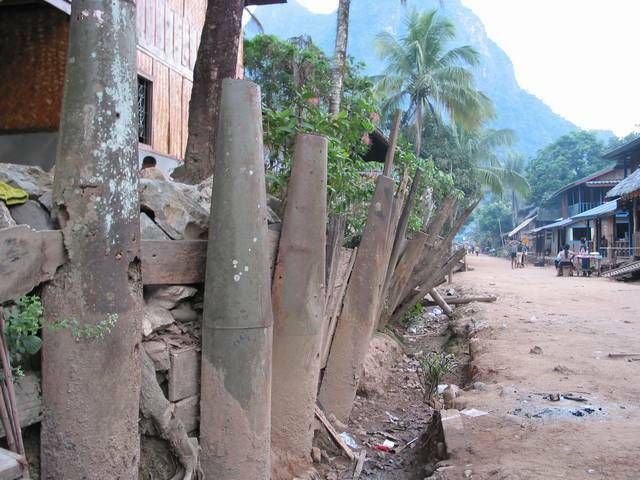 One of the more arresting sights in these villages is the use of Vietnam War era bomb casings as building materials. Laos is the most bombed country in the world when measured on a per capita basis. There are caves in this area where villagers lived for more than a decade in the late 60's and early 70's. In fact, we met the vice principal of Nong Khiaw High School who was born and lived in a cave until the age of three. 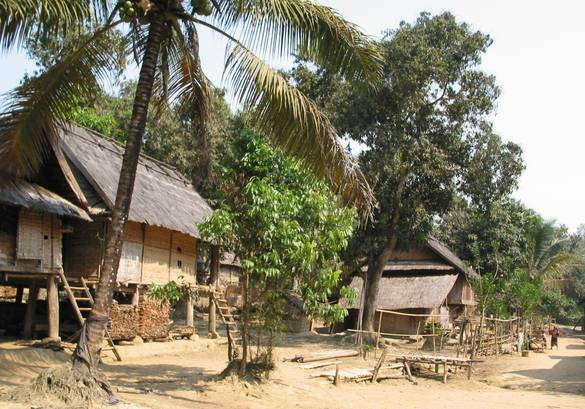 One day in Muang Ngoi, we trekked to an even smaller village, Huay Bo, home to a Khamu tribe. One of the most remarkable things about Laos is that life in many remote mountain villages goes on exactly as it has for centuries; relying on rice for food and bamboo for practically everything else (from baskets to building materials to musical instruments). The people are not wealthy, certainly, but one doesn't get a feeling of overwhelming poverty. Everyone seems to get enough food (thanks to "sticky" rice, the Lao staple) and has a place to sleep. Villages may be simply constructed but they are clean and tidy. With little, or no money to spend on things other than necessities, villagers, particularly children, make do with what they have. This brings us to ... "Things-on-a-String". 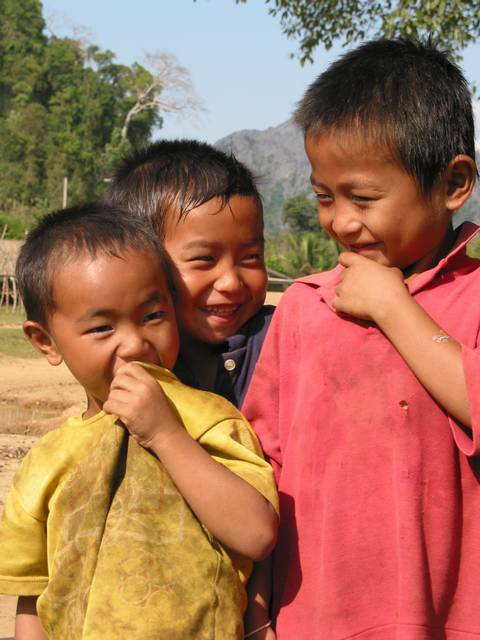 Anything, and we mean anything, can become a child's toy in Laos just by adding a string. An empty water bottle, the broken crank of a bicycle, and even a fly. Yes, a fly. Here's how it works: yank the string and the fly buzzes to life and levitates the string for a few seconds then stops. Repeat as often as you like, or until the bug dies. 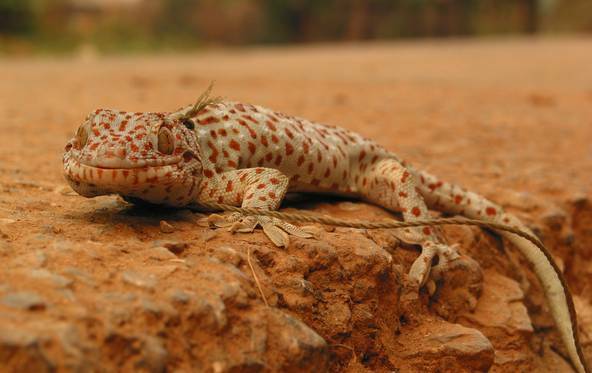 We even saw a Tokay Gecko on a string, although that was an adult toy. 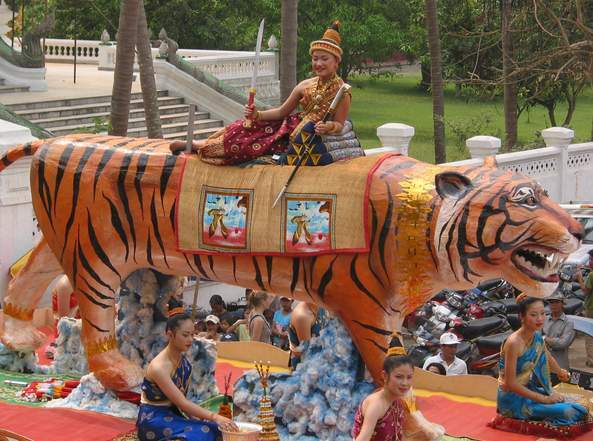 Now it's back to Luang Prabang for the Lao New Year. 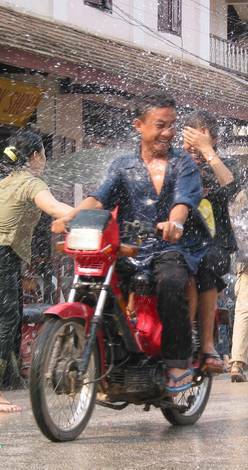 There are parades and other cultural events, but certainly the highlight for most is the tradition of water throwing. No one is immune to a bucket of water over the head, or a water pistol in the back ... anytime, anywhere. Late afternoon, though, as the temperatures reach the 90's, is when you actually welcome the dousing. One day of the week-long celebration the entire city moves across the Mekong River to build stupas, Buddhist religious structures, out of sand. 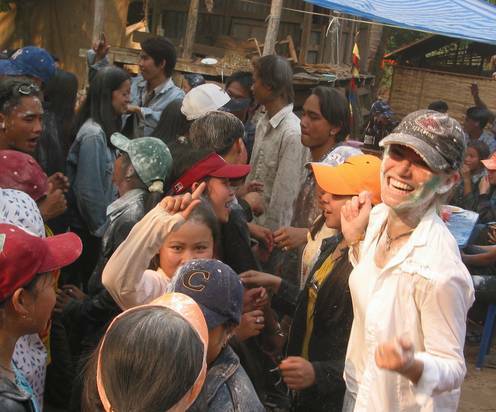 On this day, in addition to water, flour is thrown and lots of Beer Lao is drunk. The festivities still had a few days to go but we were excited about our next adventure: a three-day trek to more remote mountain villages in northern Laos. But, this is where The Enchilada's best laid plans are interrupted. First, one of us (we won't say which one) suffered the trip's first case of "tummy trauma". As were waiting for that to pass, the SARS situation heated up in China to the point we didn't feel it was safe or practical to travel there right now. 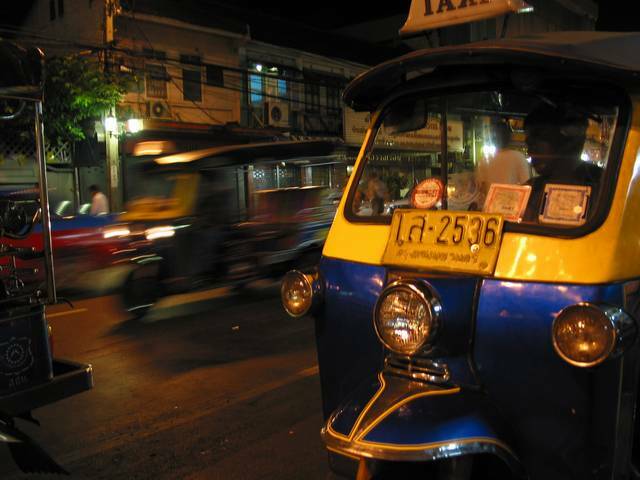 We opted against the village trek and started to head back to Bangkok, a good place to re-group and re-think our next stop. We couldn't help but be disappointed about not going to China, but our spirits were soon lifted as we spent the next two days travelling toward the Laos-Thai border down the Nam Tha river on a long boat. On board was the captain at the rear, his wife and 4 year-old son snuggled nearby, the 1st mate in front mightily steering us through whitewater with the help of bamboo poles, and two other backpackers. 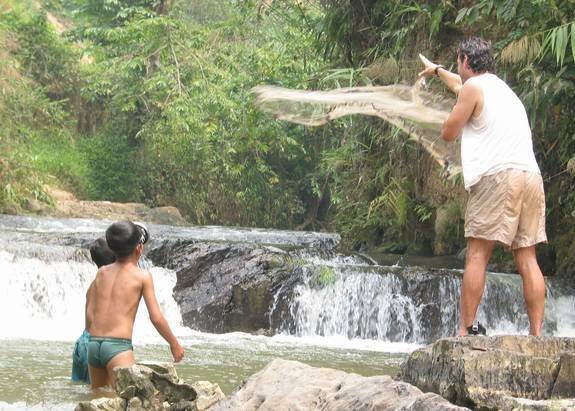 The river journey took us down rapids, through jungles, and past villages where we were often greeted by excited children eager to give us a wave and a splash! 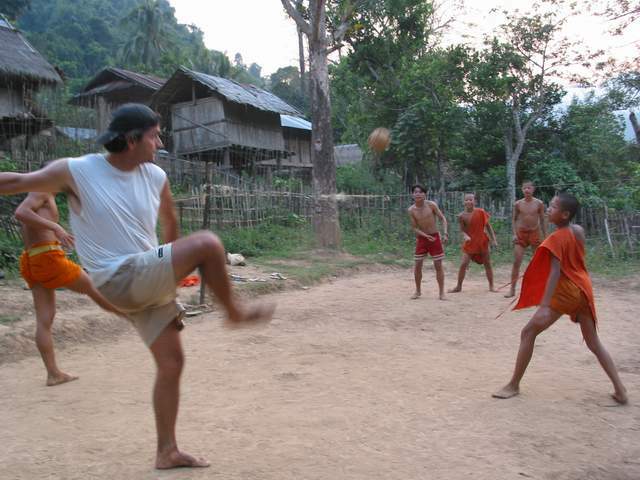 We spent the night in the crew's home village, where, within moments of our arrival, Garvin found himself well into a game of what we call "Lao Ball" (much like volleyball, without the use of hands) with a group of monks. peacefulness of Laos village life was far behind us as we found ourselves back in the bustling city of Bangkok, excited to learn where The Enchilada will go next. As soon as we know, we'll let you know. To help pass the time until then, here are some more pretty pictures.